With the look of things and actions of our ever gallant comrades , the strike action might called off in 3 days . The strike action which commenced on Wednesday , 8th of August , as a result of the non-challant attitude of the Oyo and Osun state governors towards the funding of the University . However , Information from the Public Relation Officer , Lautech SUG , the strike action might be called off soon as the management has sent a letter of appeal to the union ..
Good day to ever indefatigable Ladokites. It is no more a news that the ACADEMIC STAFF UNION OF UNIVERSITY (ASUU) has embarked on 14days warning strike owing to the governments' failure in their responsibility to the institution. After the peaceful demonstration to show our grievances and displeasures at the state of things in Lautech, basically on the current situations. On the 9th August, 2018 the student union body led by president *LAUREL* with the Senate president Rt Hon *OTUNBA* met with the school management ably led by the vice chancellor *Prof Gbadegesin* as the chairman of the management to discuss rigorously on the possible way forwards . The school management said they have tried every possibilities to appeal to ASUU as regards the 14days warning strike and also get a more reasonable commitment from the two state governments. 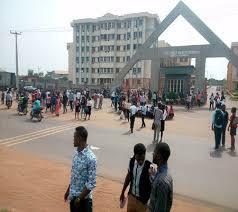 As we all know the macro economy of the two state and the fact is that the agreements between the school management, Asuu, governing council and the two state governments about a year ago, which prompted ASUU to suspend the strike embarked upon then have not been met as the agreement would have definitely help the situation of things in LAUTECH. After a lot of deliberations with the school management, ranging from diplomatic way forward and appropriate next line of actions, then the school management made it known to us that a letter has been sent to ASUU appealing to the union and the staff in order to reduce the strike action to a maximum of 3 or 5 days. Also the student union body has sent a letter to ASUU for consideration because of the ongoing examination and for smooth academic system. On this note the student union appeals to the student to await the response of the student union leaders for the way forward in this present situation as the necessary consultations to bring a positive outcome are still ongoing. Moreover the student union has mandated it to the school management to schedule a meeting with the governing council so as to have efficient facts and figures to fight with. Lautech will never fall... As much as the the current leadership of the union believes more in intellectualism we want to assure the entire LADOKITES that the radicalism in us still exists.